Picking up the stitches to knit the sleeve was remarkably easy. I have cheated a bit though because the instructions for the icord cast off unravelled my brain. 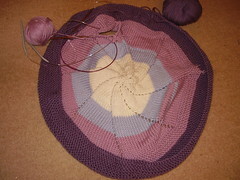 if I'm feeling brave when the sleeves are done, I *may* unpick the existing cast off and have a go at the icord.